Diageo has started work on a new state-of-the-art technical centre of excellence in Menstrie, Clackmannanshire, as part of its on-going investment in its business in Scotland. 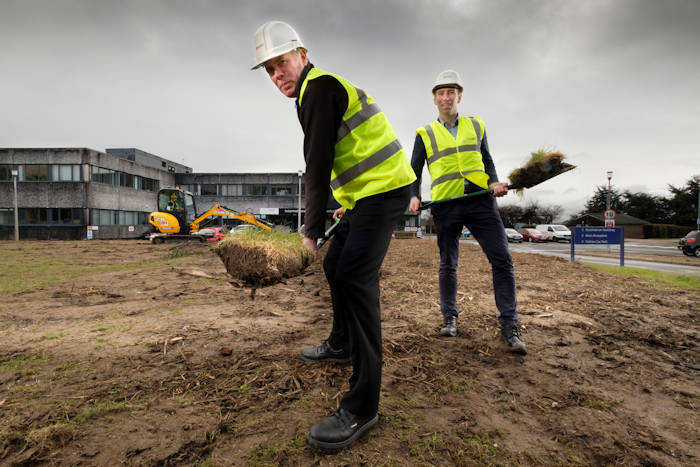 The company has broken ground on the £6.4 million project construction on the new centre that will upgrade facilities for its whisky blending, science & technology and materials testing teams. Careers in science, technology, engineering & maths (STEM) are crucial to Diageo’s business and the new centre at Menstrie will provide world-standard facilities for the company’s industry-leading scientists. It will also be a hub for innovation, not just in the spirits industry, but in environmental sustainability in manufacturing. The new centre of excellence builds on Diageo’s extensive footprint in Clackmannanshire, which includes the company’s largest warehousing site (Blackgrange), cooperage (Cambus), coppersmiths (Abercrombie in Alloa) and global brand archive (Menstrie). The investment was warmly welcomed by local representatives as positive news for the local economy. Keith Brown, MSP for Clackmannanshire and Dunblane, said: “This announcement from Diageo of a £6.4 million investment in their site at Menstrie is fantastic news for Clackmannanshire and will be a boost to both the local and Scottish economy. Luke Graham, MP for Ochil & South Perthshire, said: “It's great to see more investment coming to the County. I was lucky enough to visit the Menstrie site earlier this year and see first-hand the jobs and apprenticeships created by Diageo. Ewan Andrew, Director of Diageo International Supply Centre, said: “Our Technical Centre in Menstrie is a crucial part of our business globally, delivering excellence in science and innovation. The technical centre is home to teams who work across Diageo’s leading global brands, including Johnnie Walker, Bell’s, and J&B Scotch Whiskies, Smirnoff & Ciroc Vodka, Tanqueray & Gordon’s Gin, and Captain Morgan Rum. The new technical centre is being built on an area of unused land adjacent to the company’s existing Technical Centre, which will continue to operate as normal while the new facility is built.